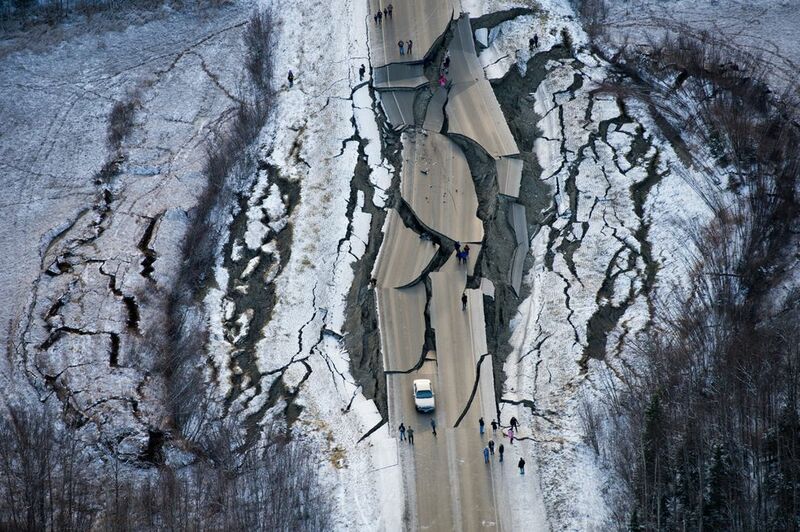 A collapsed section of road on the Glenn Highway north of Anchorage is set to snarl traffic for days as Southcentral Alaska pivoted from crisis response to cleanup in the area’s most significant earthquake in a half-century. 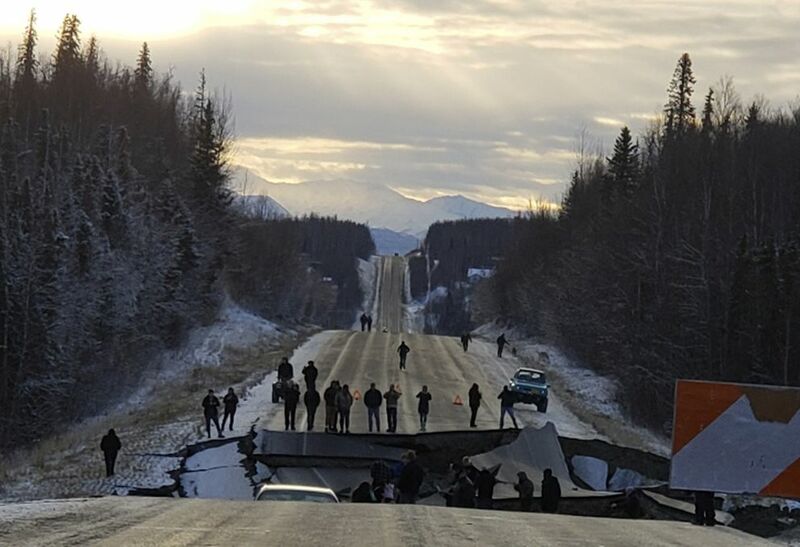 The 7.0 earthquake jolted Anchorage and the rest of Southcentral Alaska on Friday morning, cracking and collapsing roads and highways, damaging buildings, knocking out power and sending people scrambling outside and under furniture. The violent shaking left many homes a mess, and aftershocks continued through the night and through the day Saturday. Schools in Anchorage will be closed until Dec. 10, and many schools in the Mat-Su Borough will be closed until at least Wednesday. 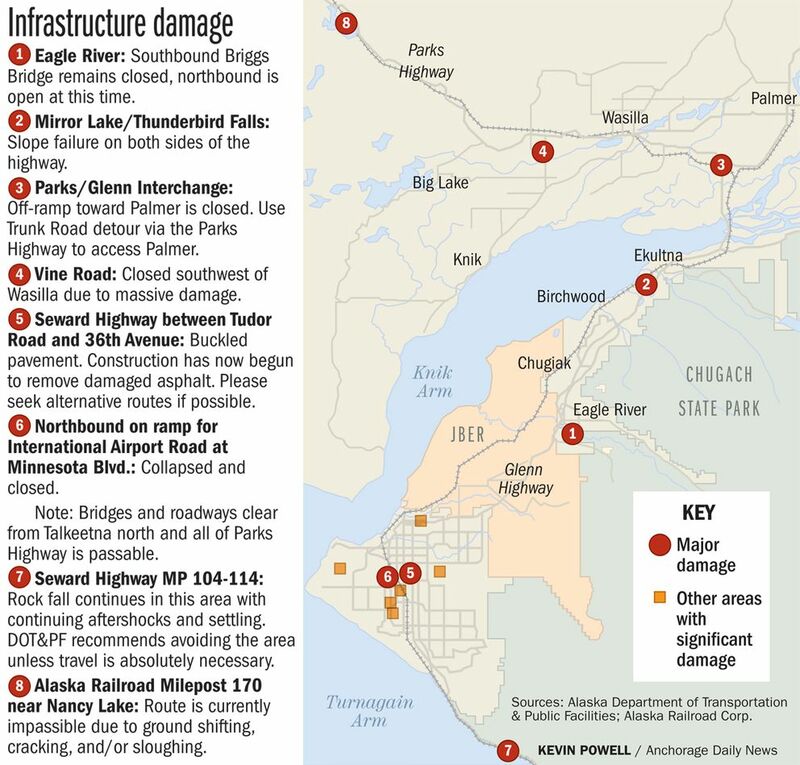 But relief was tangible as Anchorage officials reported that there were no deaths, and generally minor injuries — a broken arm, cuts from glass. 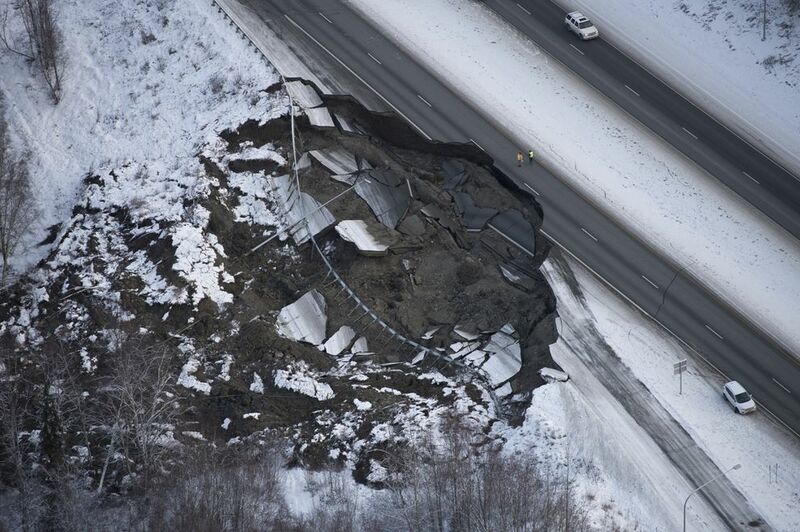 And despite widespread reports of varying degrees of structural damage, no buildings entirely collapsed, which officials credited to Anchorage’s strict building codes. Hospitals and airports were fully functional Saturday and businesses were beginning to reopen. 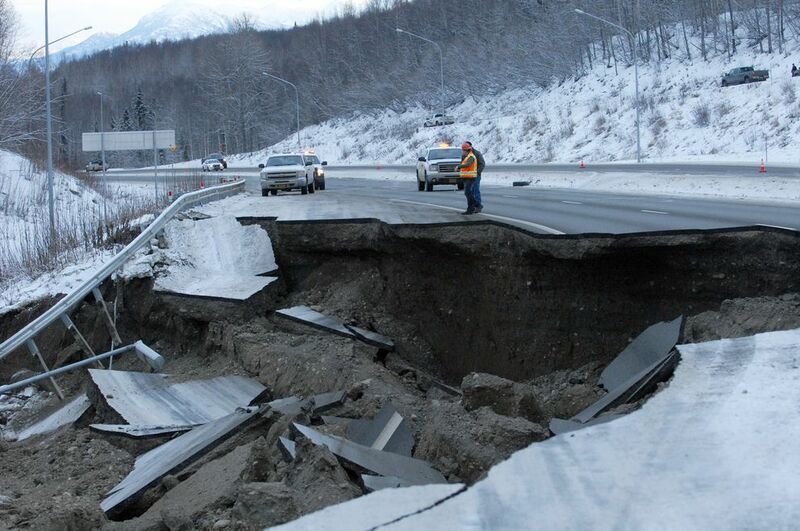 “We are on the road to returning to normal,” Anchorage Mayor Ethan Berkowitz declared at a news conference Saturday morning. 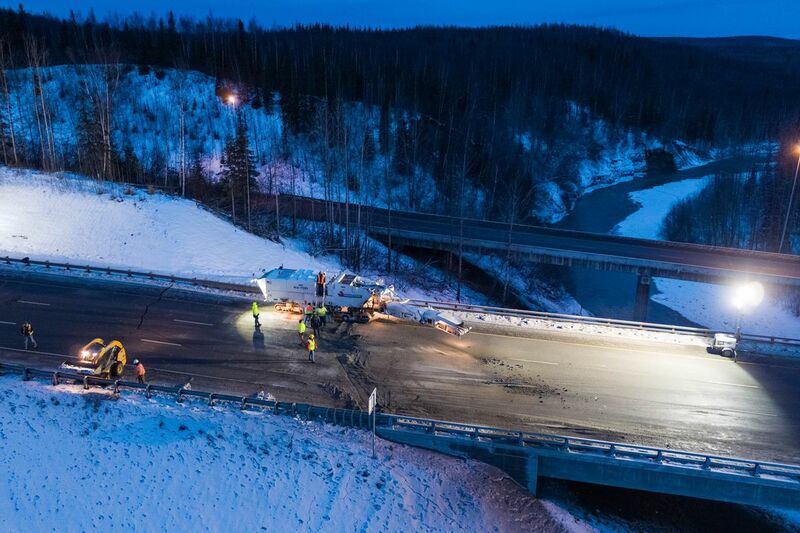 “The earthquake devastated roads and bridges across Southcentral Alaska, and these emergency funds will help reopen important sections of road more quickly to speed the overall recovery," U.S. Transportation Secretary Elaine L. Chao said in a written statement. 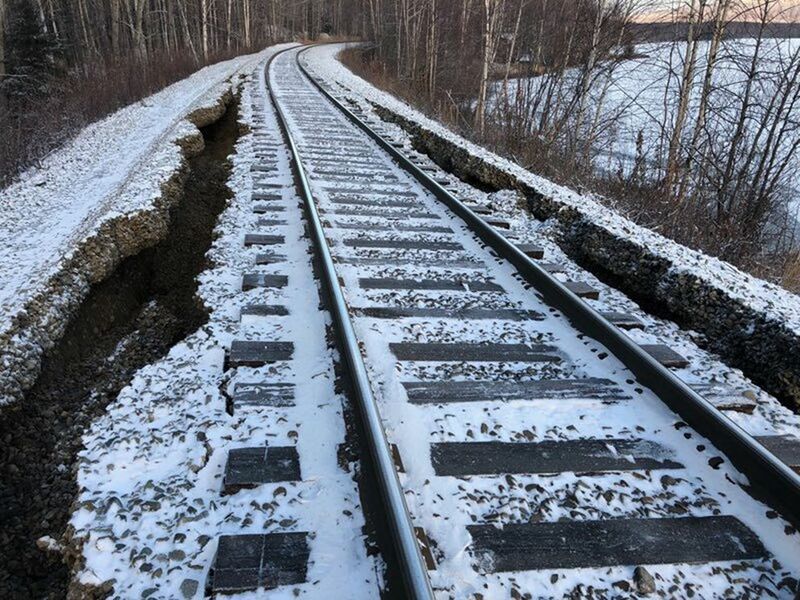 Elsewhere in the state’s transportation network, the Alaska Railroad reported that cracks, sloughing and other damage had rendered parts of the railroad tracks north of Anchorage “impassable.” It wasn’t known when service between Anchorage and Fairbanks would resume. The earthquake triggered a massive cleanup and analysis effort within the Anchorage School District. Since Friday, project managers, custodians and contractors have been systematically working through the district’s 92 schools and buildings, checking for signs of safety problems, cleaning up messes and fixing cracks in walls, said Darin Hargraves, ASD’s senior director of maintenance and operations. Early assessments Friday used a FEMA system of green, yellow or red labels, Hargraves said. A “red” school would be unsafe to enter, while a “yellow” school would have more of a maintenance problem. A green school would be clean, structurally sound and with working utilities and sprinkler systems. As of late Saturday, no schools were listed as “red," Hargraves said. A collection of “yellow” schools were being steadily moved over to the “green” category, he added. He said it was possible some schools and buildings would have to be closed past Tuesday. On the water side, officials retained a boil-water advisory Saturday for all parts of Anchorage except Girdwood. City manager Falsey said the advisory was issued “out of an abundance of caution” as crews responded to about 40 reports of suspected water main line breaks. He said there was a remote possibility broken pipes could cause bacterial contamination, though he said there was no evidence of contamination. “This is one of those weekends, boy, stay home and stream Netflix,” Hettrick said.